Descriptions and explanations of some applications of the concept of magnetic field are presented below. Applications such as electromagnets, AC and DC electric Motors, electric generators, electric transformers, electromagnetic wave propagation, maglev (Magnetic Levitation) and magnetic Resonance Imaging system are all discussed. Electromagnets are magnets where the magnetic field is produced by an electric current. They are made up of a large number of turns of wire in order to create strong magnetic fields. Electromagnets can be switched on and off and are therefore flexible means of displacing heavy metallic objects from one point to another. Electromagnets have many uses in industry. A DC motor is based on the idea that if a current carrying loop is situated in a magnetic field, magnetic forces act on the loop. The magnetic field is that of a static permanent magnet and is called the stator (from static). The force acting on the loop gives it a movement of rotation hence the name rotor (from rotation) for the loop. An AC motor is made up of a stator which is a group of electromagnets designed to produce a rotating magnetic field when fed with AC (alternating current). Inside the stator there is a rotor made up of suspended conductors. Since the magnetic field produced by the stator is rotating, it is therefore changing (magnetic field is a vector quantity) which according to Faraday's law it produces an electric current in the rotor. 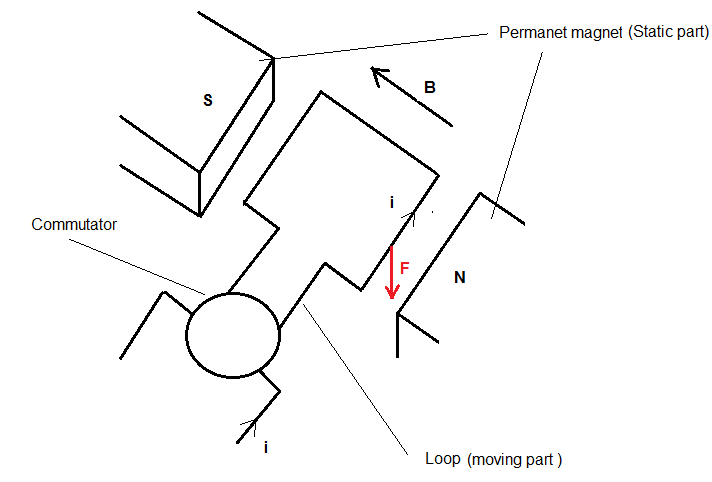 The current in the rotor in turn produces a magnetic field which according to Lenz's law opposes the magnetic field that produced it which is the magnetic field in the stator. Hence the rotor tends to try to eliminate the difference between the speeds of rotation of the field produced by the stator and the speed of the rotor since this difference in speed gives rise to induced emf in the rotor. However, the rotor never catches up with the rotating field produced by the stator. Hence a sustained rotation of the rotor. An electric generator is a device that converts mechanical energy into electrical energy using the principle of electromagnetic induction discovered by Michael Faraday: a difference of voltage is created between the end of a electric conductor moving in a magnetic field. This difference of voltage can be used to move electric charges thus generating an electric current. See How do Electric Transformers Work? in this website. Electromagnetic waves are a combination of changing electric and magnetic fields that transport electromagnetic energy from one point to another. The electric and magnetic fields associated with electromagnetic waves are vectors in planes perpendicular to each other. The direction in which the electromagnetic energy propagates (transport electromagnetic) is perpendicular to the two planes containing the electric and magnetic fields. Maglev are the fastest trains systems in the world and they use the basic principles of attraction and repuslion in magnetism. A maglev train is suspended (levitated) above a track without touching it to reduce frictions using magnetic repulsion, and propelled by a linear induction motor. Hence magnetic field is used for both levitation of the train and its propulsion. An MRI (Magnetic Resonance Imaging) system in medicine uses a combination of a magnetic field and radio (electromagnetic) waves to generate images of parts of the human body, such as the brain, spine, joints, abdomen, breast, heart and many other parts of the body. The images generated are then analyzed in order to find out if a given body part is functioning normally or not.